Learn how to play arpeggios perfectly clean, without sloppy noises and without notes ringing together. How cleanly you play arpeggios is more important than how fast you play. Learn simple creativity concepts that transform sweep picking exercises into killer licks that sound like music. Playing arpeggios ascending and descending all the time gets boring quickly. You can separate the ascending and descending parts of the arpeggio to create new sweep picking licks. Note: there is nothing wrong with playing arpeggios in the usual way (both ascending and descending). Use all 3 possibilities (ascending and descending, only ascending, or only descending). Integrate all 3 variations into your arpeggio licks. Overusing any one idea makes your arpeggios sound boring. To extend an arpeggio using inversions, you need strong fretboard visualization skills. Take an A minor arpeggio (notes A C E) and find its notes all over the fretboard. This tab shows an A minor arpeggio played in every inversion on the guitar. Sometimes, the easiest way to build musical tension is to not play any notes. Unexpected silence in the middle of a fast arpeggio builds massive tension and that tension creates a lot of excitement. This makes the arpeggio easier to play and your faster playing sounds even more intense. Tip: Change where the silence is used and how long it lasts. Don’t stop on the same note of the arpeggio every time. This keeps your sweep picking licks from becoming repetitive and boring. Combine 2, 3, 4, 5 and 6 string arpeggio shapes to play your sweep picking guitar licks. This adds variety to your playing by changing the musical texture and builds tension. Find out how to play with creative guitar arpeggios that sound cool. Find out how to develop a sweep picking technique with intensity. Learn how to clean up your sweep picking arpeggios with this video. Step 3: Create 3-5 different variations for these arpeggios, varying the number of strings (and inversion types) you use. Want to learn more cool ways to play arpeggio licks all over the guitar? Download this free sweep picking guide to learn 25 more ways to use arpeggios creatively in your guitar playing. This technique is incredibly intense and it transforms traditional arpeggios into licks that sound aggressive, yet are very simple to play. Go through all the arpeggios you know and find ways to insert bits of tremolo picking into them. It doesn't matter which notes of the arpeggio you apply tremolo to - it is going to sound GREAT every time. Most guitar players practice arpeggios separately from scales. Master guitar players can seamlessly combine arpeggios and scales into creative guitar licks that sound very melodic and emotional. This skill helps you go beyond simply playing arpeggios into integrating sweep picking with all your other techniques in a musical way. Your arpeggio licks sound a lot cooler when you vary the rhythm of the notes. Combine 16th notes (4 notes per beat), 16th note triplets (6 notes per beat) and/or 32nd notes (8 notes per beat) to add variety to the sound of your sweep picking. Notice how this lick seems to speed up and then slow down unexpectedly. This idea builds a lot of musical tension, even if you aren’t playing very fast. Variety is key to playing creative arpeggio guitar licks. Using any one idea too often sounds boring after awhile (no matter how cool it is). Practice integrating the ideas from this article in unpredictable ways. This is how you transform into an arpeggio master and impress all your friends with your incredible guitar playing. 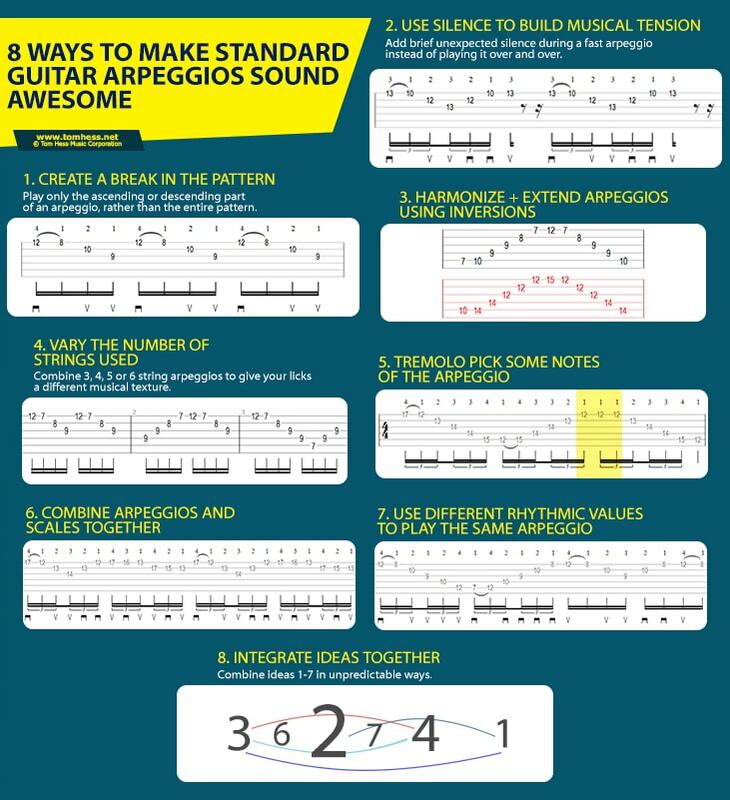 Want to get 25 more arpeggio ideas just like this & make your sweep picking sound awesome? Download this free sweep picking eGuide to learn dozens of killer arpeggio licks and become a more creative guitar player than you ever thought you could be. Become a better guitarist fast by taking online lessons for rock guitar players.